More than 8,900 cars may have issues with their transmission control modules. 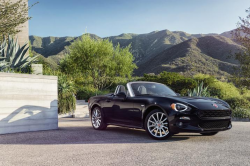 March 9, 2019 — A 2017-2019 Fiat 124 Spider recall for more than 8,900 cars has been issued if those cars are equipped with automatic transmissions. Chrysler says the cars can unexpectedly downshift without warning because of problems with the transmission control modules. Fiat Chrysler (FCA) learned about downshifting problems in January when Mazda mentioned a recall of similar MX-5 Miata cars for the same transmission control module problems. The Fiat 124 Spider can suffer from electrical noise in the range signal while driving in "D" mode due to issues with the clutch control software in the transmission control module. The noise in the electrical signal is what causes unintentional downshifting while driving. Fiat Chrysler will begin the recall March 27, 2019. Dealerships will update the transmission control module software, but owners of 124 Spiders may call 800-853-1403 and refer to recall V20. CarComplaints.com has complaints from drivers of Fiat vehicles.